A leading player in the world market for inverters, the company SMA Solar Technology AG needed a training facility in the immediate vicinity of its existing expanded site. This was built as a raised structure over an existing car park area. The construction and design resulted from the site location on the flood plain of the Fulda and the requirements of a business that is energy self-sufficient. Extensive integrated photovoltaic elements function as both roof and façade, enabling the building’s shell to combine the technical elements with the aesthetic considerations of a floating, lightweight structure. The building is anchored to the ground by a core of fair-faced concrete containing the access to the building and the supply connections. 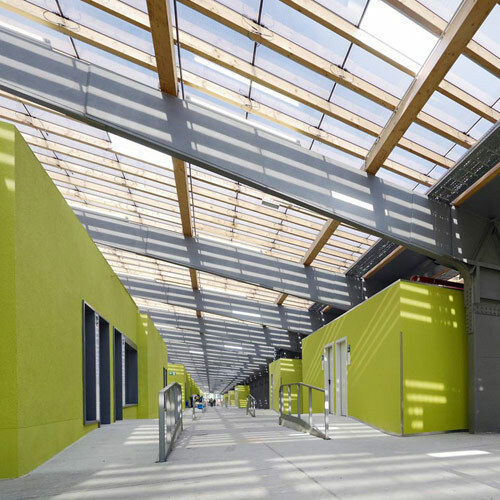 The material and design transitions between the roof, walls and underside are fluid. 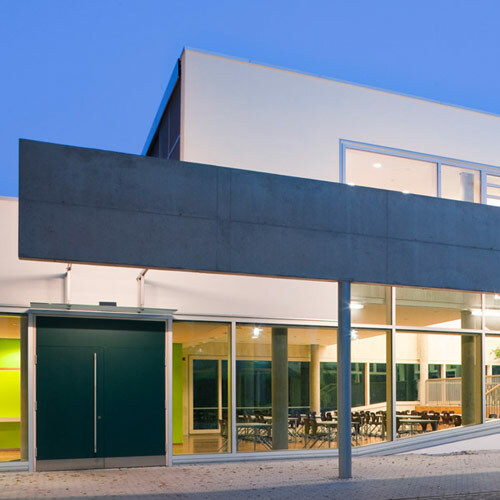 The first floor houses the foyer, training rooms, ancillary areas and technical control centre, which also functions as a showroom to demonstrate the building’s technical facilities, giving the building the status of a technical showcase. The building is completely independent of the public networks for its energy requirements and is energy self-sufficient. An “island solution”, it demonstrates one of the technologies developed by the owner, which can be used to provide electricity for locations that are remote from the grid. The solution is underpinned by high insulation standards combined with the cooling medium of ground water from a deep bore, and a biogas-fuelled CHP for winter periods when the PV output is insufficient. In line with the company’s philosophy, the use of renewable energies should make an innovative contribution to reducing the pressure on humanity and the environment. Prize for architecture "Building-Integrated Solar Technology 2011"